As a young reporter working for a newspaper in Southwestern Michigan, I once met an elderly self-taught archaeologist who had an interesting story. He had devoted his life to studying and collecting information about the numerous earthen mounds, fortresses and “garden beds” known to have existed throughout the Midwest before the land was destroyed by farming, roads and concrete jungles created by “civilization” as we know it. I spent some wonderful hours with this man hiking the woodlands and visiting the last remaining earthworks left by what was identified as a Hopewellian culture that existed prior to the Native American tribes that met European settlers. The unanswered question in all of this was just who these people were that devoted their time turning thousands of acres of land into magnificent patterns that could have mostly been appreciated from the air? And why would they build large mounds of earth, sometimes hundreds of feet wide? Excavation revealed that some, but not all were burial sites. Some of the mounds had oval or horseshoe shapes, and yet others, like the massive earthwork in neighboring Ohio, were serpentine. In Michigan’s Upper Peninsula, near the site of the Keweenaw copper deposits, have been found interesting rock formations with strange carved markings. Historian Paul Tudor Angel writes that the inscriptions have been identified as ogamic and believed made by Punic and Keltic travelers from Europe who not only explored the area, but brought copper back to their native land as early as five to eight centuries B.C. Not only that, but the English explorers who came to the area in the 1400s were surprised to come upon a tribe of blond-haired, blue-eyed Mandan Indians that spoke a form of ancient Gaelic. Some of the English explorers, who were familiar with the Gaelic languages of Ireland and Scotland, were able to converse with them, Angel writes. How could this be? What is the real history of North America and who left their marks not only in the elaborate variety of earthen works found throughout the Midwest, but an interesting display of megaliths, or giant rock structures, in the Northeast? Those “implications,” Angel suggests, are that someone else not only discovered North America, but explored and settled much of the continent long before Columbus ever made his historical voyages. That someone also preceded the claims that Viking Leif Eriksen was the first when he brought a band of explorers to Newfoundland to build a settlement of Vineland in about the year 1000. The megaliths in the New England area are strangely similar to rock fortifications found throughout England, Scotland and Ireland, all of them dating back to a time before Christ and before the Roman Empire. A clue as to their origins was uncovered by Barry Fell, archaeologist and language specialist, and author of the book “America, B.C.” in which he claims the inscriptions found on the New England stones were left by both Celts and Phoenicians. The Celts were the ancestors of the Irish, Scotch, Welch and others of Europe. The Phoenicians were the forefathers of the Palestinians. The early record indicates that both the Celts and the Phoenicians were excellent shipbuilders and sailors. Both cultures developed navies of several hundred ships and were involved in exploration for great distances south along the African coast as far east as India. What was to prevent them from traveling west to the coast of America? Both cultures seem to have reached the American coast and cohabitated there in the same area. 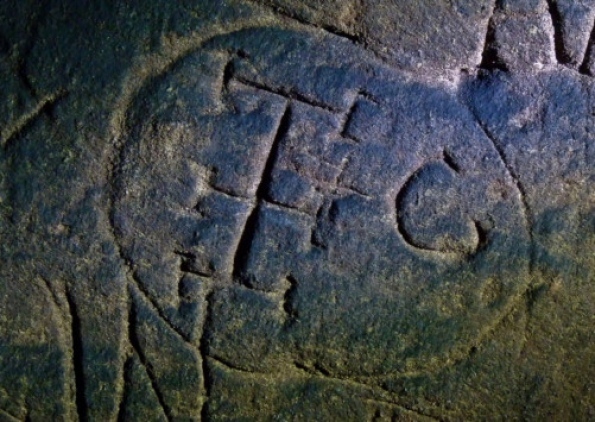 The inscriptions on the rocks in New England include both Celtic Ogam and Phoenician symbols. Both cultures were Gnostics, who built temples for worship of Baal, the god of the Sun. The Druids were among the Celts. Hanno was a Phoenician seafarer who explored and colonized the African coast around 500 B.C. He founded seven cities and established various trading posts. Greek legend said Hanno sailed the northern ocean (Atlantic?) at about 480 B.C. Was he in New England? The Kelts appear to have not only been in the New England area, but they explored the entire continent, obviously using the Great Lakes as a main route west. That they left their mark on the Keweenaw Peninsula of Michigan, where the world’s largest known core of copper was mined for thousands of years, should not be surprising. Angel notes that the ogamic tract also has been found along the Cimarron River in Arkansas and others in Kentucky, suggesting the Kelts moved from the Great Lakes south along the Mississipi River. What is even more surprising is that even more orgamic markings have turned up in the Southwest, in New Mexico. Did their ships explore the coast of the Gulf of Mexico, with explorations far inland at various points of call? Thus the Irish and the Scots . . . the ancestors of both my wife and I . . . were exploring this continent as early as one thousands years ago. Our roots go much deeper into this soil than we once imagined.